NSA leaker Edward Snowden insisted he was "trained as a spy" and had multiple code names and undercover assignments in an interview Wednesday, stating that he was much more than a low-level computer analyst. Snowden told NBC News that the US forced him to seek asylum in Russia, after they revoked his passport at a Moscow airport last year. "In reality I never intended to end up in Russia," he said. "So when people ask why are you in Russia, I say, 'Please ask the State Department.'" Snowden also insisted that his work involved multiple intelligence agencies, including the CIA. "I was trained as a spy in sort of the traditional sense of the word in that I lived and worked undercover overseas, pretending to work in a job that I'm not - and even being assigned a name that was not mine," he said. Secretary of State John Kerry scoffed at Snowden's assertions, saying on the Today show that he "should man up and come back to the United States" to face criminal prosecution and that if he agreed, "we'll have him on a flight today." "For a supposedly smart guy, that’s a pretty dumb answer, frankly," Kerry said. "We'd be delighted for him to come back. He should come back. That's what a patriot would do. A patriot would not run away and look for refuge in Russia or Cuba or some other country. A patriot would stand up in the United States and make his case to the American people." "He can come home but he’s a fugitive from justice which is why he is not being permitted to fly around the world," he said. 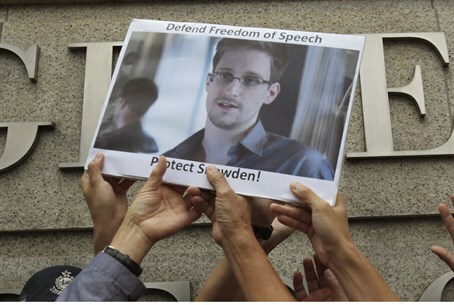 Kerry said Snowden "stole" information and did "great damage" to the United States. "The fact is if he cares so much about America and he believes in America, he should trust in the American system of justice," Kerry said. "But to be hiding in Russia, an authoritarian country, and to have just admitted he was really just trying to get to Cuba — what does that tell you?" he added. "I think he's confused. I think it's very sad."